Bulgaria has the second most Police per capita in Europe and the eighth most Police in the world. A conclusion could be drawn then that Bulgaria should be the second safest country in Europe and the eighth safest in the world and if you thought this, you would of course be very wrong. The first answer might come as a shock to some Bulgarians and yet to many it is a daily reality. The Police run the majority of criminal operations in Bulgaria. Almost all of the country’s organised crime groups are run by some branch of the state security apparatus. For example Sofia Police (МВР) run the prostitution rings as pimps, sometimes it is a voluntary relationship between the prostitute and the Police, other times it is forced and takes the form of racketeering and blackmail. If a client of a prostitute doesn’t pay, most likely the client will run afoul of the Police. There are cases where Police are doing their dirty work for themselves, but of course other Police use a middle man who is the apparent pimp and he then passes the money up to his Police overlords. The same is perfectly applicable for all other crime syndicates too, for example drugs. Heroin traffickers are caught at Bulgaria’s borders, but the traffickers bring in 50 kilograms. However when we read the documents from the Border Police (Митничари), which they have submitted to court for the trial, the amount of heroin has miraculously diminished to 40 kilograms. This doesn’t change anything for the heroin mule who was arrested, as far as the courts are concerned 50 kilograms will get you the same sentence as trafficking 30 kilograms. The missing 10 kilograms is stolen by the Bulgarian Border Police. Ironically the heroin trafficker was driving the heroin to Western Europe, but the Bulgarian Border Police then feed the heroin they have stolen into the Bulgarian society as it is easier for them. There is no incentive for the mules to report the missing heroin and so the practice continues unabated. The same is equally true for the human traffickers. And only recently was it exposed the systematic trafficking of irregular immigrants illegally through Bulgaria’s border check points by the Border Police themselves. Many of the people smugglers too work directly for one or another of the state’s security agencies. Some of them work for the Border Police, but also a number of them work for the State Agency for National Security (SANS – ДАНС). Sometimes the smugglers are paying a percentage to their SANS controllers, other times SANS uses the pretence that their smugglers are working as informers. It is all too typical, but the “informers” then operate with impunity whilst getting rid of their competition. The competition has to either start working under the “informer” or risk being tortured by the Police and in a worst case scenario framed and sent to prison. Everything is centralised, with money flowing up, first to day commanders, then to group commanders then to Directors and then from there to the Ministers and Vice-Ministers of the relevant state security agencies. If you remember in 2008 Rumen Petkov was then Minister for Interior who gave his resignation amidst allegations of running drug smuggling rings. The Chief of Police also gave his resignation amidst accusations that he was connected with drug dealers. More recently heads of the Bulgarian Border Police have been under “investigation” for collecting the money from their various dodgy businesses (далавера). The various Directors of Immigration over the years seem to always be in the news for selling Bulgarian citizenship and there is no reason to believe that this practice has discontinued. There are even cases where criminals have wanted to stop crime, but the state security agency that is controlling them won’t allow them to stop. There were cases where drug dealers had stopped dealing for the state, but then they were arrested and sent to prison. These are one of two groups of crimes “bosses” in prison. The other group are those who have run afoul of interdepartmental fighting or infighting amongst state security agencies or political parties. When different Police commanders have turf wars over who has the monopoly on the drug trade in a certain area, the civilians who work for the Police are the victims, and can end up in prison as part of a vendetta against their Police boss. The same can also happen where jurisdictions overlap officially, so SANS which has jurisdiction nationally across Bulgaria can have conflict with local authorities over the control of the drug trade. Every time a government changes, there is a massive instability amongst the criminal world of Bulgaria as they are accountable directly to the relevant ministers. The Bulgarian Socialist Party, BSP, dominated most of the drug trade and other criminal networks, but in 2009 when GERB won the election, the spoils of war went to the victor and without too much bother alliances were switched from one party to another. The majority of bureaucrats who facilitate the crime networks submitted to the more powerful of the two crime families between BSP and GERB. Those bureaucrats who refused to submit to their new overlords were removed. Of course we are forgetting the massive amounts of embezzlement that these same people carry out systematically. Sabri Sapundjieva, who was the Vice-Minister of Justice during the Oresharski government, spent over 50 000 leva (25 000 €) of state funds for the renovation of the apartment she was living in at the time. The funds were destined for the maintenance of Bulgarian prisons and most likely were not used for a renovation at all, but were instead syphoned out through fake building companies so that the cash could be pocketed. It is also highly likely that Sapundjieva had intended on selling the apartment she lived in to herself at less than the market value, but the resignation of the Oresharski government disrupted her plans when the interim government was put into place. Recently it was published that the Prosecutor’s office dropped the entire investigation and so in a single case 50 000 leva evaporated from the public funds of the Prison Authority (ГДИН). 50 000 is just what we know she “spent” on the renovation of the apartment she lived in, the real amount of embezzled funds is most likely hundreds of thousands, if not a few million over a year. It is also noteworthy the amount of murders the state security agencies commit that are later covered up. But what can we expect when the Prime Minister Boyko Borissov oversaw the blowing up of a petty criminal with 15 rockets. The European Court of Human Rights (ECHR) ruled that the shooting of 15 rockets at the petty criminal, Chakara, was a violation of his human right to… LIFE! What is a violation of someone’s right to life? Nothing less than murder and who gave the order to shoot the 15 rockets at this man? Boyko Borissov gave this order, yet the Head Prosecutor has not opened an investigation based on the ruling of the ECHR and no one is holding their breath for the Head Prosecutor to actually do his job. 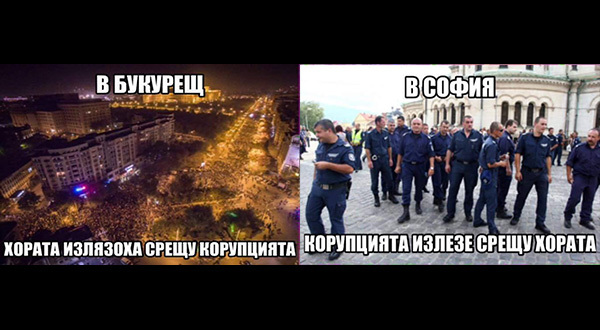 In Bulgaria there is no such thing as the “Mafia”, at least in the stereotypical way. There are no crime bosses and really there are no organised crime groups. This is because it is the state security organs who run everything. The biggest of criminal “bosses” that we see in the media at least, are either former police or work for the police. In the same light there should be no doubt that the romantic image of the free spirited criminal boss in Bulgaria is completely wrong. It is not the criminal that approaches the Police to corrupt them and to get away with his crimes; it is the Police who go to people with the proposal of working for them criminally. The supposed “mafia” in Bulgaria is not independent; it is under total submission of the state security forces. This is also a problem for activist prisoners trying to reform the Justice system and not just for prisoners but for any activists in Bulgaria. Immediately after an activist has made a confrontation with any corrupt state officials, they become a target from the so called “mafia” who act as nothing more than the auxiliary of said state officials. The subjugated criminals also must protect their masters as in reality without their masters, they are incapable of continuing any form of serious criminal activities. The reality is that the criminal gangs wear uniforms. They wear uniforms and sit in government and at the head of agencies. Any battle against crime or organised crime is a complete whitewash without heads of state security agencies behind bars, alongside the Ministers whom they work for. The Bulgarian government has not decreased organised crime at all, every investigation into the organised crime groups is stopped by the Prosecutor’s Office, for example the embezzlement by the Ministry of Justice during the time Sabri Sapundjieva was Vice-Minister of Justice. At least 5 bureaucrats were complicit in that single act of embezzlement, and yet not a single one was prosecuted. Here in prison we have petty thieves who do years of prison time for stealing as little as 20 leva. No one damages Bulgarian society as much as the organised crime groups of embezzling and drug dealing bureaucrats. Someone needs to tell the Bulgarian government and Prosecution’s Office, that zero conviction rate for mass embezzling by public workers and Ministers does not mean zero crimes. Stop putting chicken thieves in prison and start imprisoning the real organised crime leaders!